thick so please feel free to make it to the consistency you will enjoy. Some add coconut milk instead of milk and you can always try. You can add even saffron for extra flavour but I have not added as cardamom flavour itself is enough to go well with jaggery. This javvarisi payasam with jaggery has a rounded sweet flavour that every one will enjoy with each sip. 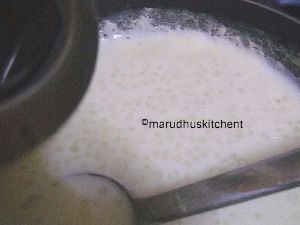 Sometimes even I add semiya with javvarisi and do this payasam its a variation that you can always try and it tastes really good. 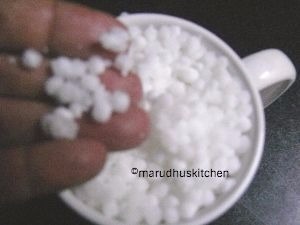 1.Wash and soak javvarisi for 30 minutes or till they puff up. 2.After soaking the sago will be double the amount. 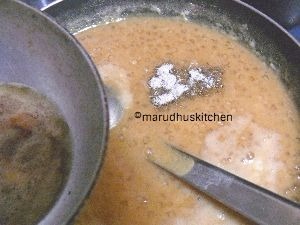 3.Take 1/2 cup of water and add jaggery and bring to a boil till all the lumps dissolves,then filter to remove dust and keep aside. 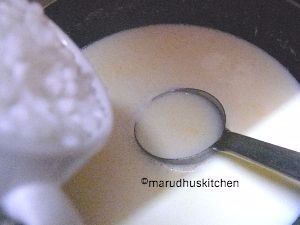 4.Keep a heavy kadai with milk and when it starts boiling add javvarisi and cook till transparent. 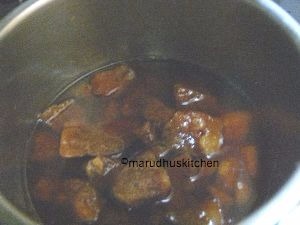 5.Then add the jaggery syrup and let it boil till the rawness of jaggery goes off. 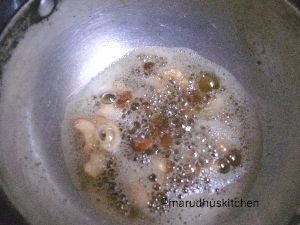 6.In-between keep kadai with ghee fry cashews till golden and lastly add raisins and switch off and keep ready. 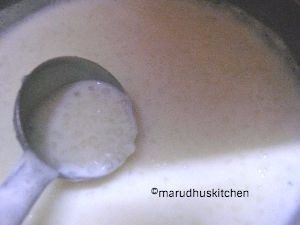 7.At this stage you can add some water when boiling itself to get correct consistency if the payasam becomes thicker. 8.Now when done add fried nuts and cardamom powder and switch off.